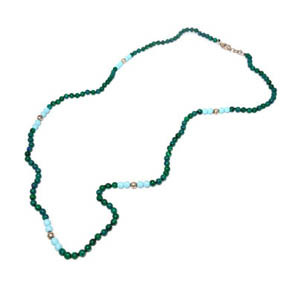 Crafted from malachite, reconstructed turquoise, and silver beads on a 22" hand knotted necklace, this necklace gives of a very natural vibe. Beads measure 3mm. 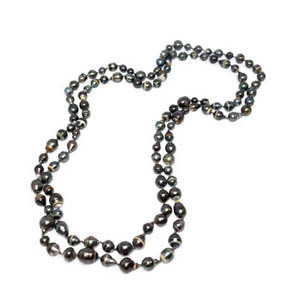 This necklace is made from Tahitian pearls strung on a hand-knotted cord. Necklace length measures 54". 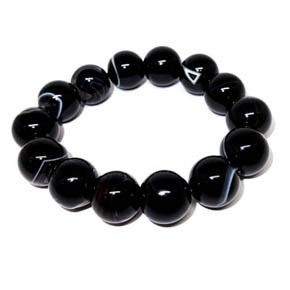 This beaded bracelet is crafted from 16mm black agate beads. 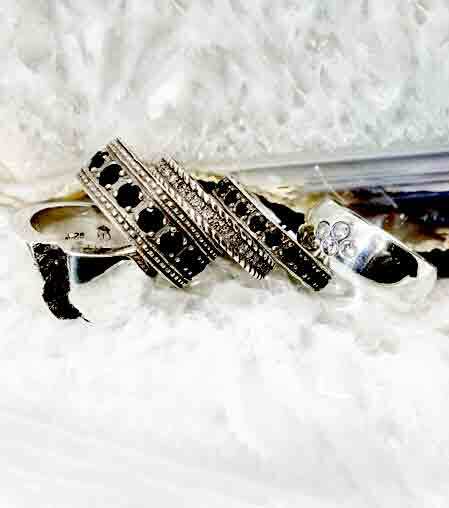 The black agate is marbled with fine ribbons of white agate. 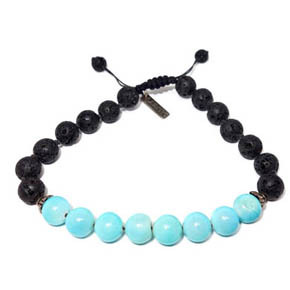 The light blue of these 8mm Peruvian opal beads contrast with the 8mm dark black lava beads in this handsome adjustable bracelet. 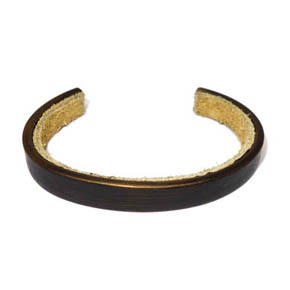 Simply tug the ends of the bracelet for a customised fit. 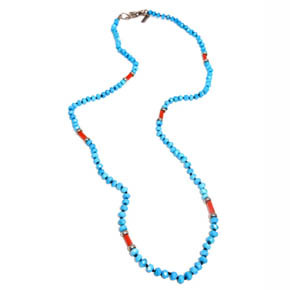 Hand knotted 3mm turquoise, 3mm x 6mm Italian coral, and sterling silver come together in this charming necklace. Necklace measures 22" in length. 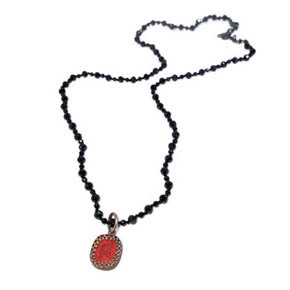 This 24" spinel beaded necklace is fitted with a 1940's Red Glass and sterling silver cameo pendant. 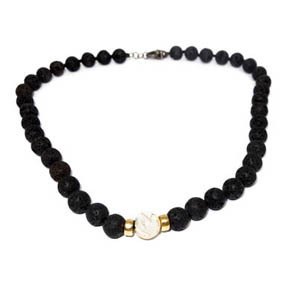 Spinel beads are 3mm-5mm in diameter and cameo pendant measures 16mm x 14mm. 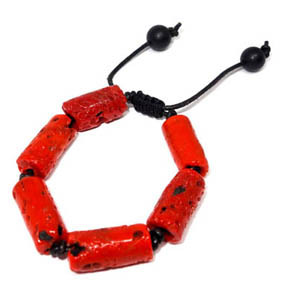 This bracelet features six hand-carved red ceramic beads on an adjustable leather cord with 8mm onyx beaded tips. 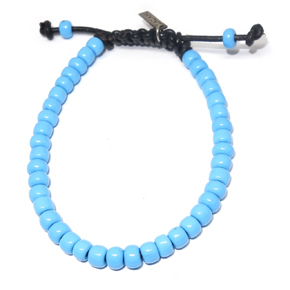 Ceramic beads measure 22mm x 10mm, bracelet measures 7"-9". 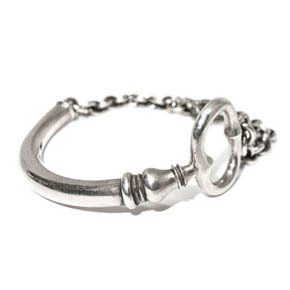 This sterling silver chain bracelet features an oversize skeleton key and engraved lobster-claw clasp. 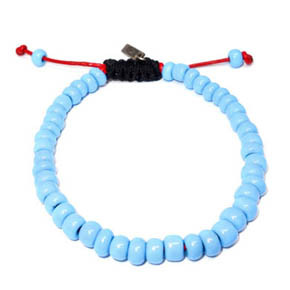 This bracelet is crafted from 6mm baby blue ceramic beads strung on a hand-dyed red leather band. 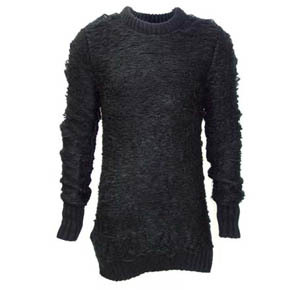 Also featuring an adjustable closer for comfort, simply tug on the leather cord ends to tighten to desired fit. 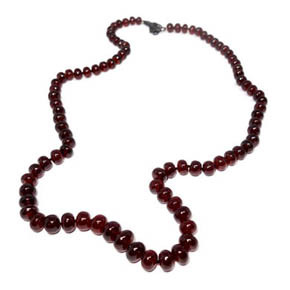 This garnet necklace features hand-shaped and smoothed graduated garnet beads on a hand knotted chain. 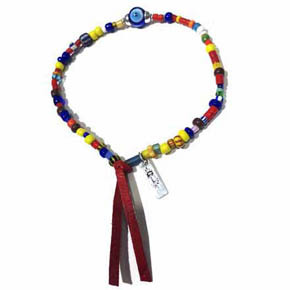 Necklace is 22" in length and beads size varies between 6mm-9mm. 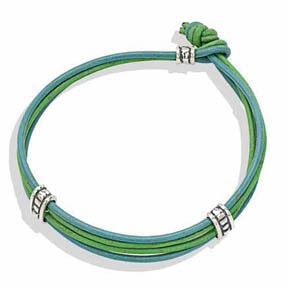 These handmade high quality green and turquoise braided leather bracelets feature multiple bands fastened together with sterling silver rondelles and a knot closure.